Prince Jade by Celesta Thiessen is available at Amazon, Barnes and Noble, and BooksAMillion. 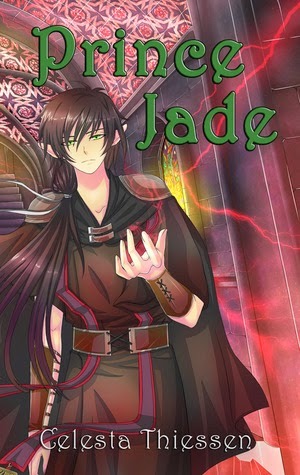 Jade, the fourteen-year-old, second-born prince of Kedrin, is full of unnatural powers and an uncontrollable darkness. He is ready to seize the throne. But when Jade’s life takes an unexpected turn, he meets Marigold, a simple farm girl who embodies everything that he is not. Gradually, for the first time, he begins to want the light. Christian Fantasy. I'm Eclectic Pagan and I received a free copy of this book in exchange for a review. The religion wasn't what turned me off. I actually liked the way Christianity was utilized to influence the characters; it was one of the strong parts of the story. But, I would have liked the story more if it had been shown to me rather than told. Let me experience events with the characters, flesh out those action scenes instead of telling me a list of conflicts that lead up to the climaxes. This book has several conflicts and could easily be a thousand-pager but all that action is reduced to a list of events that I'm told in under 200-pages. That reduction disconnects the characters from each other, which affects my ability to relate to the characters.